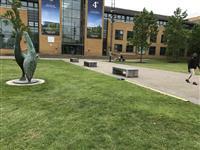 This route starts at the Main Piazza and runs to the Library/Learning Centre, Via the Austin Pearce and Teaching Blocks. This route is approximately 325 meters long. 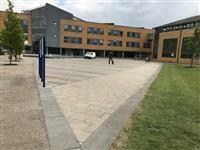 Related link Austin Pearce Building (Block AP). 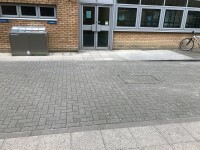 Related link Teaching Block (Block TB). You are on Piazza to Austin Pearce. Skip to the next section. 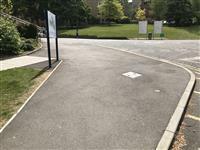 Once at the Piazza, follow the path leading from the bus stop straight to the Austin Pearce building. 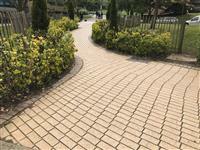 The path is level and has a compact stone surface. 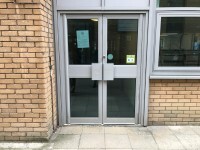 Please see the Austin Pearce building access guide for more information. You are on Austin Pearce to Service Road via Block BB/BC. Skip to the next section. 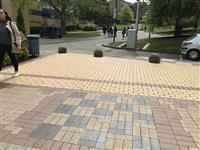 As you exit the Austin Pearce building at the rear entrance, cross the road to the BB/BC Blocks. 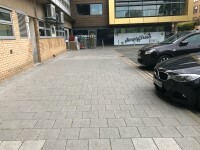 The road has a block paving surface and is level throughout the majority of the area. 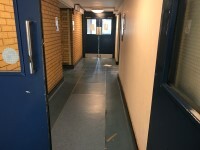 Enter the BB/BC Block and carry on through the corridor to the back doors (please see the BB Block or BC block access guides for more information). 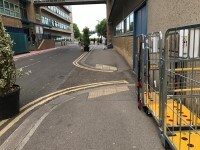 Once you exit the BB/BC Block, continue along the road unit until you reach the top of the hill. The surface at this point is very uneven and has a steep gradient. You are on Service Road Past Blocks AC and AD to Path in front of Performing Arts Centre. Skip to the next section. As you come up to the service road, turn right and take the path along side the service road. 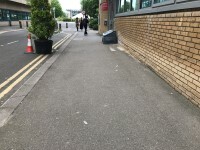 The path is level and has a tarmac surface which in uneven in places, including dropped kerbs with tactile paving as you pass a gate into Block BC (photograph 2). After 90 metres, you come to a crossing. 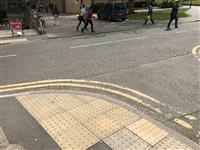 The crossing has a dropped kerb with tactile paving on either side (photograph 6). 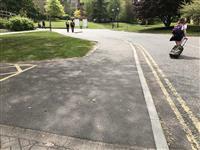 Once you have crossed, follow the tarmac path for another 25 metres, past the roundabout to another dropped kerb. 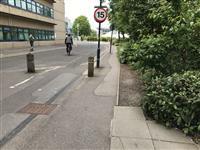 Use the dropped kerb to cross the service road to the Teaching Block (photograph 8). 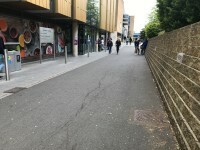 Then follow the block paving path, which is uneven in some places, up the steep hill for 20 metres until you come to the end of the path. 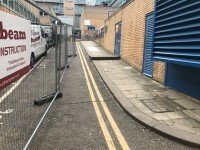 To access the Teaching Block from here, continue straight ahead onto the service road for a short while, then turn right. 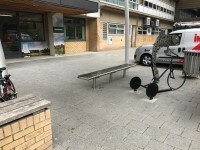 You are on Path in front of Performing Arts Centre to Library. Skip to the next section. 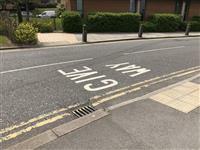 Cross the service road using the dropped kerb. 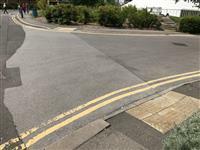 One side has tactile paving and the other does not (photographs 1 and 2). 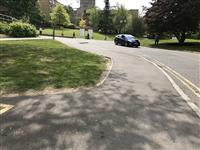 Once across the service road, turn right and follow the path up the steep hill towards the roundabout. 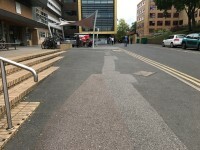 The surface of the path is tarmac. 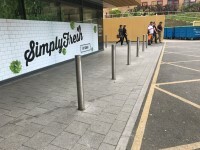 Once at the roundabout, follow the path round to the left (photograph 4). 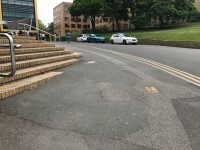 The path has a tarmac surface and continues to have a steep gradient. 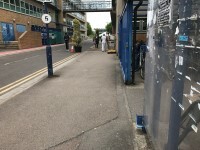 The path continues up the slope, passing the steps up to the Library ground floor entrance to the left (photographs 5 and 6). Past the steps the path begins to level out. 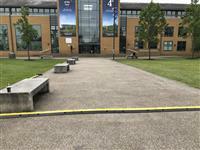 Continue to follow the path as it weaves round the road, which brings you onto the block paved surface, then turn left and follow the block paved/tarmac path for 25 metres to the Learning Centre main entrance. The path here has an easy gradient up.